The low-growth patch in which the Turkish economy appears to be trapped will lead us to speak more of unemployment in the future. I have pointed out many times in this column that despite sluggish growth, many jobs have been created during the last year. This strong job creation took place particularly in the service sector. As a result of rising employment but a slower pace of added value, labor productivity has so far decreased in the service sector in 2012. This is an exceptional event in the development of the economy. Admittedly, the trend won't continue. As long as growth remains weak, and there are many signs that this will be the case, unemployment may accelerate its true rise. Economic bureaucracy and labor economists focused too much on the relationship of growth to employment in the past. The robustness of economic growth as well as its capacity to create jobs have been the main subjects in debates on joblessness. Now, the capacity for job growth has risen tremendously following the global economic crisis, due to significant employment hikes in the service sector as noted above. In addition to plentiful hiring in the public sector, I think incentives like the 5 percent cut in social security premiums as well as higher cuts in premiums for hiring young people and women have also contributed to the capacity of growth for job creation, along with other factors still to be identified. The lack of a contribution of economic growth to job creation, however, can no longer be blamed. But the problem is that even with a high capacity for job creation, a growth rate of less than 4 percent will not be sufficient to prevent unemployment from rising in the future. Here we come to the structural features of unemployment that have until recently been widely neglected by the academic community as well as by public institutions. If economic growth remains weak and its capacity to create jobs remains stagnant, we must find other ways to address unemployment. Readers who are not familiar with labor economics should not believe that the existence of a rather high unemployment rate, which Turkey has, at 10 percent, means that all available jobs are occupied, that the unemployment problem is exclusively a problem of insufficient labor demand. 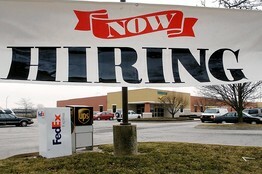 Rather, job vacancies coexist commonly with people looking for jobs, i.e., with unemployment. Readers should know that the existence of a high number of job vacancies amidst high unemployment is definitely a sign of the existence of the issue of structural unemployment. What is the level of structural unemployment in Turkey? The first survey to offer an answer to this question was recently completed by the Turkish Employment Organization (İŞKUR). Unfortunately, our media ignored this original and important survey. İŞKUR surveyed a thorough sample of firms that employ at least 10 workers in the months of September and October 2012. According to the survey, firms employed 6.240 million employees and maintained 270,000 job vacancies, with a weighted national average of job vacancies of 3.3 percent. This is a very high rate, signaling a serious problem of structural unemployment. For the sake of comparison, let me note that, according to the European Union Statistics Institute (EuroStat), the rate of job vacancies was 1.4 percent in 2012 for the countries of the EU, in which unemployment numbers are quite similar to those of Turkey. Eighteen percent of firms surveyed responded that they have job vacancies, with 27 percent expressing difficulties in finding suitable workers for the available jobs. As for the reasons for these difficulties, 54 percent of firms point to the insufficient qualifications of applicants, 51 percent say simply there were no applicants and 45 percent report a lack of experienced applicants. Those are factors preventing employment from the demand side of labor. But there are supply-side factors: 27 percent of firms declared that applicants had not accepted the offered salary and 26 percent declare that applicants do not like the working conditions offered. The minimum wage is most likely too low in the developed West but too high in the underdeveloped East, where the main problem is an under-qualified labor force. Let me conclude the discussion of structural unemployment with a few final figures. TurkStat's 2012 unemployment statistics by college graduation show that the jobless rate among health personnel is limited to 2 percent, while the same rate reaches 21 and 22 percent among persons with degrees in the humanities and journalism, respectively. Obviously, the Turkish labor market suffers from a serious problem of a mismatch between labor supply and demand.